Our plan was to take a short flight the first day out of Richmond to Dulles, and then take the very long flight from Dulles to Beijing the next day, both on United. So on the first day we left home at 11:30am and it poured rain all the way to the airport in Richmond. We parked the car at the Richmond Homewood Suites where they agreed to keep it for 21 days for free – the room is $124 and we’ll stay there overnight upon our return. Took the hotel shuttle to the airport (in the rain). We departed from Richmond Int’l Airport at 3:30pm after 1½ hour delay due to bad weather out of Chicago. Guess the rain is pretty widespread. The flight was short but bumpy to Dulles. Raining. Got more than a tad damp outside the airport waiting for the shuttle bus to the Homewood Suites where we were staying overnight. Probably the finest Homewood Suites we’ve stayed at – off Sunrise Valley Drive. The dinner was superb (nice salad with chicken and dumplings) and the wine was plentiful. The hotel is spotless – the hotel manager cleans off the tables, setting an example for his employees. In bed by 9pm – almost a first for me. Great sleep. So much for the first leg of our travels. I awoke at 5:00am – stayed in bed till 6:00 when DH (dear husband) finally woke. Had a lovely breakfast and were on the shuttle to airport at 9:00. Still raining. Went through an “expedited” TSA process – we didn’t have to take off our shoes, they said we didn’t have to separate our liquids (although we already had) and no body scans. Long walk to gate; lots of escalators. Hung out in the United Lounge for a couple of hours. Boarded flight on time but left about a half hour late. Still raining. 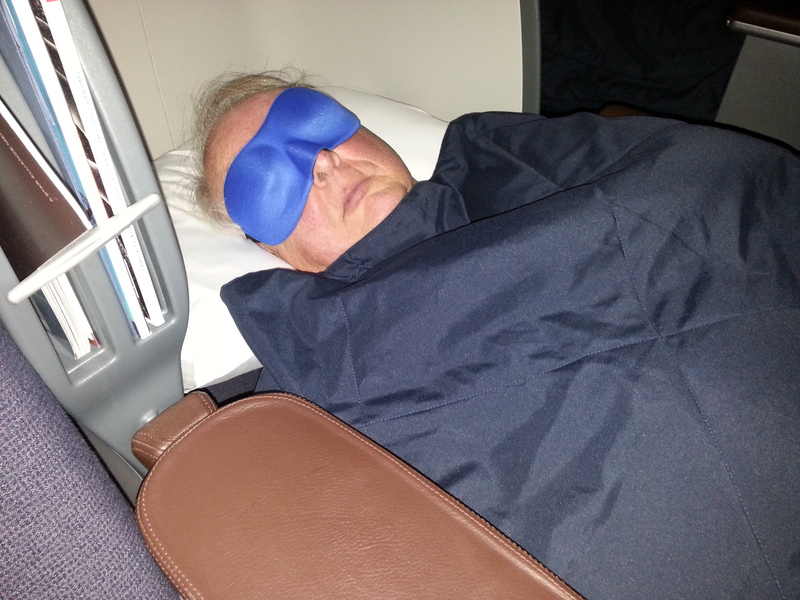 Love these lie-flat seats in Business Class – only way to fly! Had a great shrimp cocktail. Salmon was overdone but certainly better than normal airline food. DH’s steak was also overdone, but he said it was tasty. We both watched The Great Gatsby while sipping our champagne, and DH watched one additional movie – something he figured out he had actually seen before – after he’d seen the whole thing. Unfortunately, our seats were near the galley where it seemed there was a constant gab fest among the flight attendants. Despite that, I got about 5 to 6 hours sleep and didn’t feel too bad when we landed. DH said he didn’t get any sleep, but I heard him snoring several times so I think he got some. Let’s hope it’s not raining in Beijing.